I never considered myself a collector of anything until the day that I bought my first old magazine. Even my DVD collection was small at the time, since I mostly borrowed from the family pool and didn’t yet have the funds to start building up what has now become a mound of movies that I could probably build a solid fortress out of. It was about two and a half years ago. 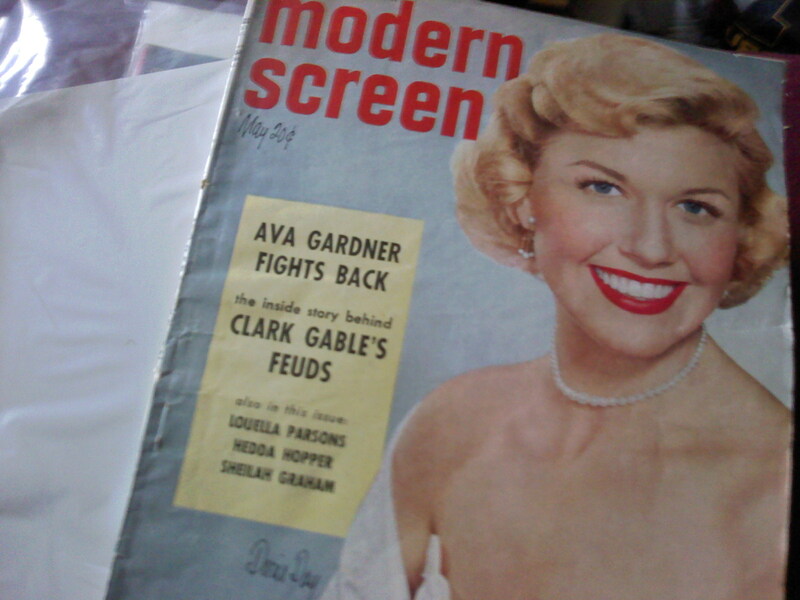 I was browsing what is now my favorite antique store when I came across the May 1952 issue of Modern Screen, featuring Doris Day on the cover. The booth was actually full of great movie magazines (and has provided me with many of my favorites over the past few years), but I latched onto the first one I saw and ran with it (in order to save my bank account from complete destruction, and because I knew I’d love to own one with Doris Day on the cover). Much like today’s gossip magazines, the information in these issues isn’t always accurate and I take it all with a grain of salt, especially if I’m reading about an actor I’m not too familiar with. But they’re still a whole lot of fun to flip through. I was also completely won over by the interesting advertisements and the peek into the past that the magazine gave me. 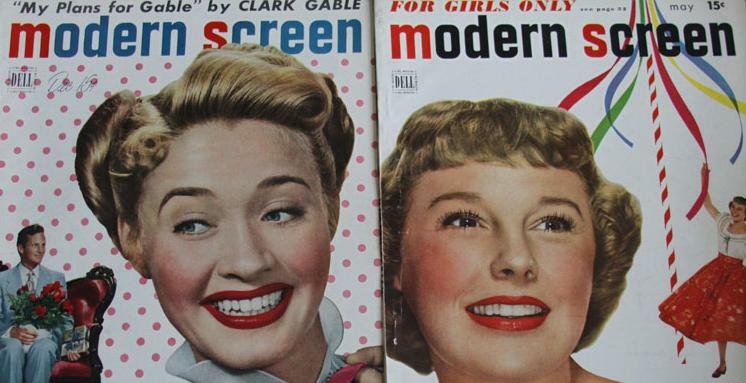 Though Modern Screen is a magazine focused on film specifically, its pages give insight into the general culture and lifestyles of the past. I’ve always been interested in history, and in the early to mid-20th century in particular, so this encounter with a popular periodical published during that time was a really cool experience for me. I was instantly hooked. My obsession with these gems continued to grow. I now own 84, 75 of which were published before 1980. My collection has expanded beyond just film magazines to include informational publications like National Geographic, pulpy mags like True Story, propaganda pamphlets, movie-related paperbacks and hardcovers and a few general lifestyle magazines. Though my collection has expanded past movie mags, they’re still my favorite to read and collect – especially Modern Screen! As mentioned in an earlier announcement, I’ll be sharing excerpts from these magazines every once in a while, because if you are interested in classic film at all (which I’m assuming you are, as a reader of TMP) you’re probably just as interested in those fascinating ads and articles as I am. I’ve already posted two excerpts on love from True Story (one on engaged love, one on married love). Stay tuned for more, and let me know if there are any specific magazine issues you’d like to see a post about. (More photos can be found on tumblr if you’d like to look at some of the specific headlines, but these posts were made quite a while ago and don’t show the complete collection!) Some of these publications will also be featured in TMP’s upcoming, self-explanatory series called “Could it be a movie?” which will also feature novels and short stories. Wow! What an impressive collection! I think I’m a bit jealous. Thank you! I didn’t fully realize how massive the collection is until I made this post. These mags are surprisingly easy to find at antique/resale shops in my area, though, so it’s easy to keep it growing!